A bucket list itinerary, this is the ultimate in South African adventure taking in Cape Town, the winelands, the garden route and a once in a lifetime safari experience at a game reserve. You’ll have the chance to take in Table Mountain and Robben Island in Cape Town, before driving to sample some of South Africa’s finest wines in the winelands. This itinerary also has a stay in Plettenberg Bay, Africa’s most spectacular beach down for the ultimate escape. 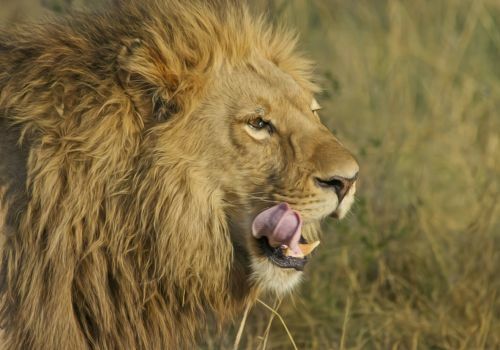 The trip concludes with a fantastic three days at either Kwandwe Private Game reserve or the Amakhala reserve where you’ll head out on safari and experience the some of the best wildlife in the region. Upon arrival, pick up your hire car and head to your Cape Town hotel. 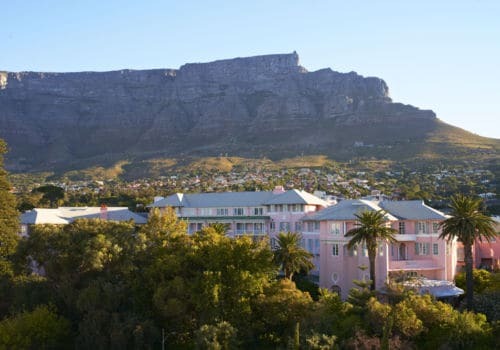 You’ll spend three days in Cape Town exploring the beauty and history of the city. Places such as Table Mountain, Robben Island and the Cape of Good Hope are all easily reachable and are well worth spending time at. Cape Town is by far the continent’s most gay-friendly destination with a number of great venues and if you’re planning a wedding then it’s also a beautiful destination. Today you’ll drive into the winelands, about 40 minutes from Cape Town to the 5* Grande Roche Hotel where you’ll stay in a Studio Suite. Your stay includes sparkling wine and an Oyster breakfast. 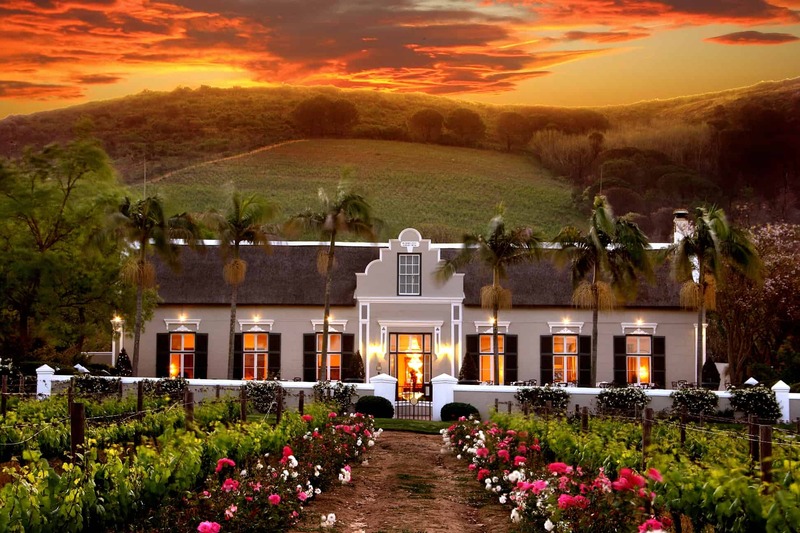 Nestled at the foot of the magnificent Paarl Rock Mountain, the boutique hotel is where history interacts with modern day comforts and the gentle rhythm of a working fruit and wine farm creates a peaceful escape for rest and relaxation. A proud member of Small Luxury Hotels of the World, featuring 28 elegant suites you will experience comfort and tranquility, personal service and meticulous attention to detail. With breathtaking views across the Paarl Wine Valley, Grande Roche Hotel offers guests the perfect setting for a Winelands escape. Award-winning Bosman’s Restaurant offers all year dining with fireplaces for winter and an outside terrace overlooking the vineyards for summer evenings. Michelin trained Chefs infuse classic South African dishes with international cuisine and the in-house Sommelier is able to recommend wines from the list of 400 labels. 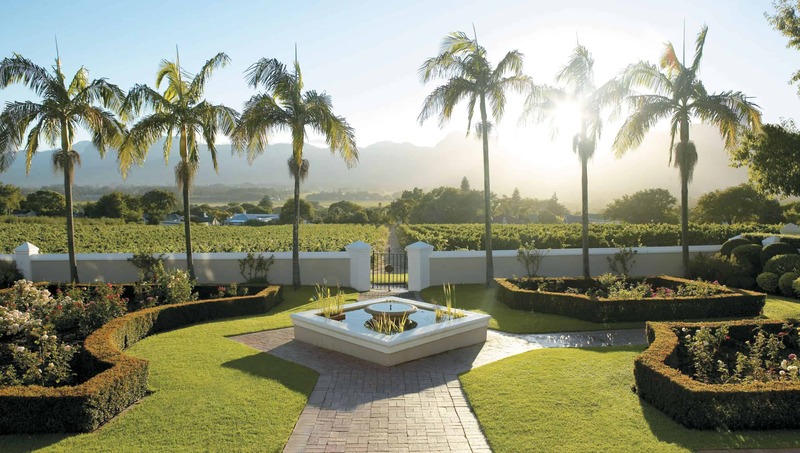 The boutique choice is The Last Word Franschhoek, an exclusive 5-star historic residence in the heart of the Franschhoek village, the gourmet capital of South Africa. The hotel is just a minute’s walk from excellent award-winning restaurants and numerous character-filled boutique style shops and art galleries. The Franschhoek valley offers world-class wine estates, tastings and cellar tours nestled between towering mountains and beautiful vineyards and the picturesque French village hosts some of the best cuisine from internationally recognised gourmet chefs. The valley is also the idyllic setting for walking trails, hiking, cycling, bird watching, horse riding, fly-fishing and golf. Whilst you’re there the hotel can arrange a host of luxury escapes including horseback wine tours, gourmet dining at some of South Africa’s top restaurants, exploring the region’s French heritage – unforgettable memories are waiting to be made. You’ll stay at the Rosenhof Country House, where you are able to enjoy traditional country cuisine complemented by an extensive wine list. There is a fully equipped gym and sauna and with its luxurious facilities and excellent service, Rosenhof is recognised as one of the finest establishments in the region. The boutique choice is Hlangana Lodge, one of the finest small luxury establishments in South Africa. Every room has a private veranda overlooking the exotic gardens and saltwater swimming pool. You’ll drive to the beautiful Plettenberg Bay. Situated on a rocky headland in Africa’s most spectacular beach town of Plettenberg Bay is the ultimate escape, The Plettenberg. This owner-managed property showcases the most breathtaking vistas in Southern Africa with views of the ocean, mountains and endless stretches of golden beach. Located in the heart of South Africa’s elite favourite seaside vacation spot and Garden Route, world-renowned for its excellent outdoor activities. It is the ideal place to both relax and unwind or recharge and reinvigorate. At The Plettenberg the charming service and the setting combine to create the ultimate story, one of a South African seaside experience unlike any other. At our boutique option, the Hog Hollow, you’ll find outstanding cuisine, personalised accommodation & hospitality. With just 16 rooms all with private wooden decks, king-sized beds, most with cosy fireplaces. Breakfast & dinner served on the boma deck or around the communal candle-lit dining table. Spend a few nights here soaking up the coastal atmosphere and relaxing. Spend three nights at one of our recommended game lodges. All your meals are included as well as safari activities. At the 5* Kwandwe Ecca Lodge you’ll find a vast wilderness flanking the banks of the Great Fish River in South Africa’s Eastern Cape region. 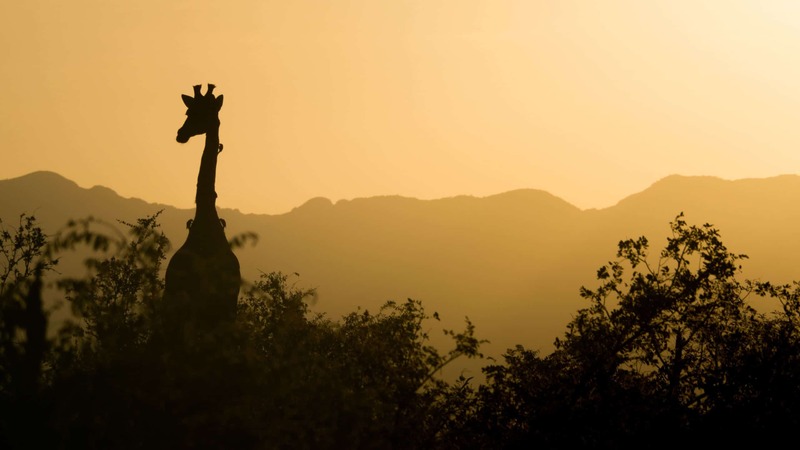 Home to a diverse array of wildlife including the ‘Big Five’, as well as cheetah, hippo, springbok, giraffe and more. The soul-stirring beauty of the landscape lends its charm to all four of its modern, yet intimate lodges and villas, all Relais & Chateaux accredited. A delight to travellers young and old the reserve provides superb game and bird viewing as well as providing habitat for protected species such as the Black Rhino and Blue Crane. Some days you’ll take a safari vehicle and the next a boat cruise. Other activities on the reserve include bush and big game walks, boat cruise, fishing, massages, rhino monitoring, rhino darting and bush banqueting. For our boutique option, you’ll find Hlosi Game Lodge a 5-star Eastern Cape lodge in the Amakhala reserve. Lying along a curve of hill above the Bushman’s River plain in the Eastern Cape, the luxury game lodge is a quiet, grassland retreat offering a rich and intimate luxury African safari experience. As part of the 7000-hectare Amakhala game reserve, Hlosi provides a rich, informative luxury experience. This intimate lodge redefines exclusivity with four individually styled twin/double suites designed to capture the spirit of a bygone era, while providing the luxuries of contemporary lodge living.